This attractive pie will be welcome on any special occasion and it couldn't be easier. You don't even have to make a crust! The pie filling separates as it bakes to form a crust, a custard filling, and a chewy topping. To keep it low-FODMAP, stick to one piece. Even sweeteners, such as maple syrup, that are considered suitable for a low-FODMAP diet should be limited to small portions on the elimination phase. Place an oven rack into the lower 1/3 of the oven and preheat oven to 350F (325F if using a glass pie plate). In a large bowl, beat together the eggs, milk, and maple syrup with a whisk or electric mixer until foamy. Stir in the rice flour, cornstarch, tapioca flour, vinegar, melted butter, vanilla, and coconut flakes. Pour the mixture into the prepared pie plate. Bake for about 40 minutes, until golden brown and bubbly on the edges. Chill the pie for several hours or overnight. Sprinkle with confectioner's sugar. Cut into wedges for serving. Six tablespoons of Pamela's Artisan Gluten-Free All-Purpose Flour Blend can be used in place of the brown rice, cornstarch, and tapioca flour. 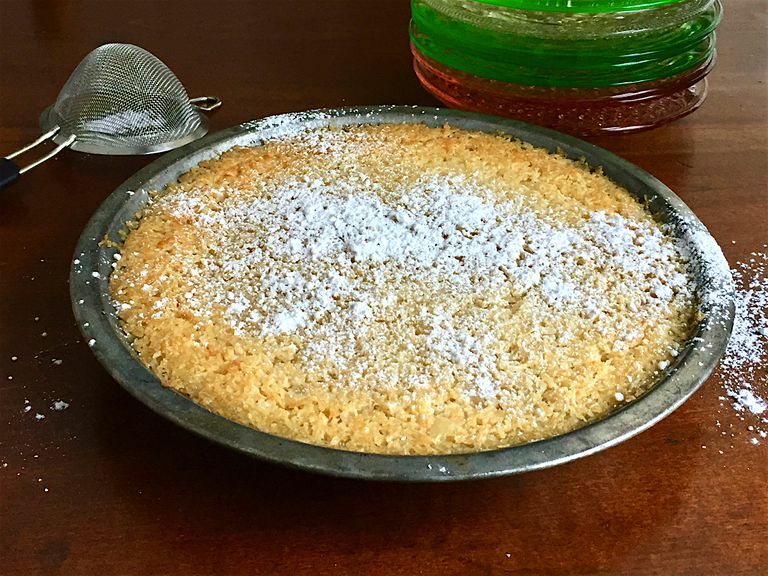 This recipe was not designed for typical, sweetened shredded coconut often sold in the baking aisle. Purchase unsweetened, dried shredded coconut in bulk bins or in the health food section of the grocery store. This pie contains eggs and milk, so it should be stored in the refrigerator.